While we still know of only one planet with proven life, there is broad consensus in the scientific community that Earth is probably not unique in the universe in this regard. Evidence is based on the unimaginably large number of stars in our galaxy alone, which are believed to host an even more unimaginable number of exoplanets and exomoons. Further evidence is the relative speed with which life, in its simplest form, arose on the young planet Earth. However earth-shaking the discovery of simple extra-terrestrial microbial life might be, the real blockbuster would be the discovery of more complex, intelligent life forms. After all, it would be more rewarding to exchange blueprints for space ships and warp drives than to just spend endless hours at a microscope (although such a notion might appear naïve in view of the somewhat limited discourse that took place between European settlers and various native peoples). Irrespective of the probabilities, what would extra-terrestrial life be like? Is there anything in general we can say about what to expect out there? As Stuart West expounds in his essay, there are indeed some educated guesses that we can make regarding hypothetical alien life. The number of planets that are estimated to be capable of supporting life in the observable universe ranges from just a few billion, to a trillion, depending upon how you make your estimates. While there is clearly a wide margin of error in such estimates, and they are maybe better seen as "guesstimates", the bottom line is that life could probably be supported on a lot of planets. A hell of a lot of planets. But, what would we expect life on those planets to be like? Thinking about alien life has generally been dominated by science fiction. Depending upon when you grew up, and what films you watched, your images of alien life could range from parasites with acid for blood, friendly little creatures with a glowing finger, or highly spiritual blue forest dwellers. However, we don’t have to rely on what will work well in a movie, we can also apply science, to predict what life would be like on other planets. It is useful to split the question of "What would life be like on other planets?" into a number of smaller questions, that can be tackled in turn. How easy is it for any life to evolve? How can we get from something you would play with in a chemistry classroom to the simplest living organisms? Given that some form of life evolves, is it likely to evolve into something more complex? Something that we might notice, and be interested in. If complex life evolves, what would it be like? What features could we expect it to have? In all of these cases, we can turn to biology and chemistry, what we know about our world, and what mathematics can predict, to predict how and what could be happening on other planets. Furthermore, most people aren’t really equally interested in the above questions. What we would be really interested in is complex life evolving on other planets. Finding a simple replicating organism, that could only be observed under a microscope would be an amazing and fantastic discovery. But, it would be blown away by finding something the size of a Wookie from Star Wars. Consequently, we are especially interested in the first two questions multiplied together – what is the chance that life has evolved and produced something complex? We can start answering this question, by combining our knowledge about life on earth with insights from mathematical models of how evolution operates. The first step in the origin of life is chemistry. On earth we believe that there was a period of chemical evolution during which more complex molecules were produced, which could function as the building blocks of life. The energy for this chemical evolution could have come from sources such as ultraviolet rays arriving from space, or the heat from hydrothermal vents deep in the ocean. Since the 1950s scientists have been able to induce such events in the lab, and so we know ways that chemical evolution was possible. Eventually sufficiently complex molecules were produced on earth that they could make copies of themselves, sometimes perfectly, sometimes not quite perfectly. At this point, we had reached the simplest possible life, which we might call replicators. The problem is that we just don’t know how chemical evolution got us to replicators, what caused it, or how likely it was. Despite considerable efforts, scientists just haven’t been able to reproduce this step, and create artificial life. Consequently, if we went back to the beginning of our planet, we don’t have a good idea of how likely is it that we would get replicators again. Given this uncertainty, it is hard to predict the likelihood of life initially evolving on other planets. It has even been suggested that life could have evolved somewhere else, and was carried here on meteorites. But that doesn’t provide an answer; it just moves the problem to somewhere else (another planet!). In contrast to the fuzziness of our understanding about how life initially evolved, we have a much better idea about what and why would happen next. This is because we have a much better understanding of how biological evolution shapes life than how chemical evolution led to life. To an extent that is because life is around us, and so we have been able to both develop and test theories about how life has evolved. We have been able to develop a body of evolutionary theory that can explain the diversity of life, and the different forms it takes. We can even watch evolution in action, as animals adapt to new environments or pathogens evolve antibiotic resistance. So, if some simple replicator had evolved on another planet, could it become more complex and how likely is that? The answer to these kinds of question comes from Darwin’s theory of natural selection. Darwin was trying to explain how evolution could lead to organisms, such as plants or animals, that looked as if they had been designed. A giraffe looks like it was designed to eat leaves from tall trees. An arctic fox looks like it was designed to be hard to spot in the snow. A cheetah looks like it was designed to run and catch things. Darwin was trying to explain this appearance of design. Heredity – offspring tend to look and behave like their parents. If you reproduce or replicate yourself, you make something similar. Variation – organisms differ in how they look and act. Not everything is the same, for example different humans look different. Differential success – some things are better at surviving and replicating themselves than others. Natural selection is the change that arises over time, given these three ingredients. Imagine a population where not all individuals are identical (variation). If some individuals are better at surviving and reproducing (differential success), then they are more likely to replicate themselves or leave offspring. These offspring will be like their parents (heredity), and so the next generation of this population will consist of individuals that are better at surviving and reproducing. Consequently, over time, organisms will evolve to become better at surviving and reproducing. This will lead organisms appearing to be designed or "adapted" for the environments in which they live. Natural selection. Natural selection operates if three conditions are satisfied: variation, differential success linked to variation, and heredity. 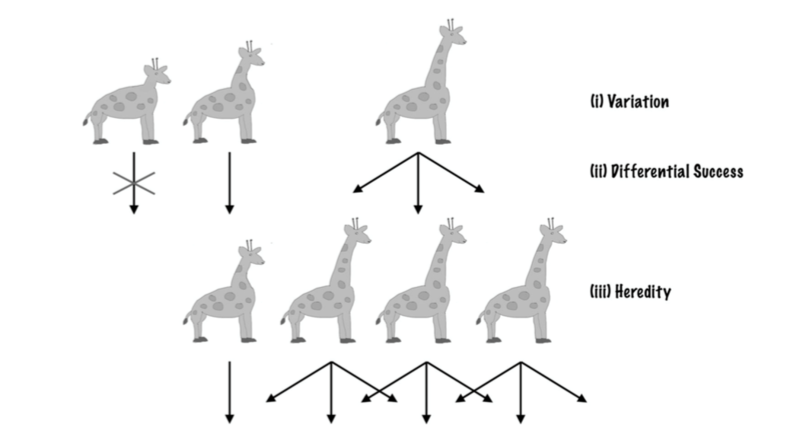 We illustrate that with an example: the evolution of long necks in giraffes. (i) Initially, there are natural variations in giraffes’ neck lengths. (ii) Longer-necked giraffes have access to more food, high up in the trees, and so live longer to have more offspring. (iii) Giraffes’ offspring resemble their parents. As a result of (i), (ii) and (iii), the population gradually shifts to be dominated by long-necked giraffes (Image credit: Tom Scott). Darwin’s theory made few assumptions and is remarkably general. He didn’t know about genetics, and his theory doesn’t require DNA-based organisms. It just requires that when something reproduces or replicates, it makes something that is like itself (heredity). DNA is just one way for this to happen - natural selection wouldn’t care what the building blocks were on other planets, as long as there was heredity. Consequently, while natural selection acts in the same way on simple replicators or elephants, it should also apply in the same way to completely different alien life forms. For example, it wouldn’t matter if the life forms were based on carbon, silicon or unobtainium. Once you have life, natural selection becomes a literally unavoidable logical consequence. This means that we can apply evolutionary theory to predict what aliens would be like. If life evolved on another planet, we think that it would then be subject to natural selection. But what does this really mean in practise? What would we predict? If we were an astrobiologist landing to study life on another planet, what would we expect to see? It is useful to answer this hierarchically going from the very general and more vague to the more precise. The first question is should we expect complex life forms? Given a planet where life evolved, with some form of simple replicator, should we expect this to evolve into more complex forms? Something we would notice, that would justify placement in a sci-fi movie. I suggest that this jump from simple to more complex life is probably much more likely than the initial evolution of life. Natural selection isn’t directional, in that it doesn’t have something it is working towards. But it is directional in that it improves organisms, making them better at surviving and reproducing. And becoming more complex can be a useful way to do that. On earth, over about four billion years, we have gone from a simple primordial soup to the amazing diversity of organisms that we see around us today. That is a huge increase in complexity. Consequently, if life initially evolved on another planet, then it is highly likely to diversify and increase in complexity. If the world in which alien life evolved was not completely uniform then there would be selection for different forms that were adapted to different environments. “Different organisms for different niches’” could be the campaign slogan for alien life on any planet. Different niches can also be created biologically. Once there is enough life there would be selection to produce things that could utilise the waste products of that life, or to predate that life, or to parasitise that life, or just something that could outcompete it. 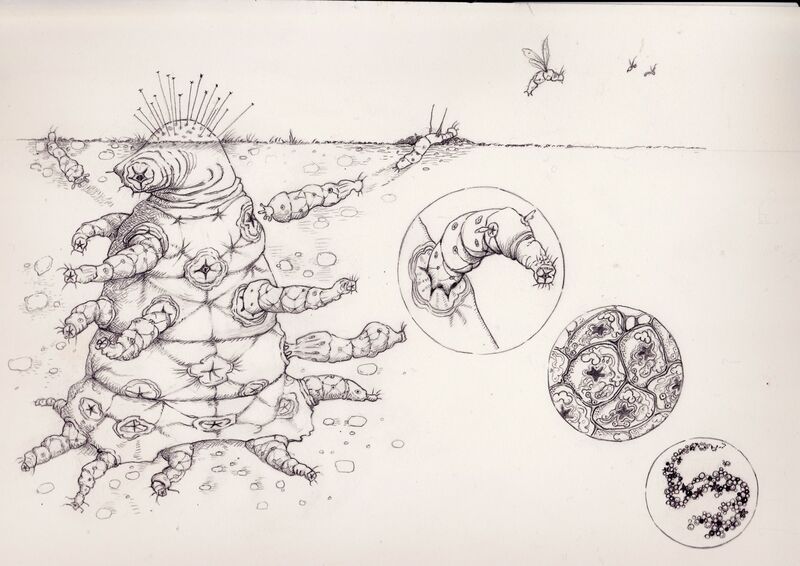 Sometimes these steps would involve more complex organisms evolving. What is key here isn’t that complexity is always increasing, in everything. Furthermore, complexity can even go down. But, if complexity does sometimes increase, then gradually, over time, this can lead to more complex life. Indeed, when life first evolved, in the simplest possible replicators, complexity couldn’t decrease, and the only route was to increased complexity. Another relatively general prediction is that, like all of life on earth, aliens will look as if they were designed to live in the habitats that they inhabit. If an organism lives in a hot desert-like environment, or aquatically, it would have a physiology adapted to cope with that. This can also lead to predictions about biomechanics or shape. For example, fluid dynamics tells us what shapes are good for moving through water, producing submarine shapes that share features with fish. So, if we found aquatic aliens, they would be likely to be streamlined. This raises the issue of convergent evolution. On earth there are many examples of different organisms evolving to look very similar, because they live similar lifestyles and not because they are closely related on the tree of life. A great example of this is provided by a comparison of the Australian marsupial mammals with the placental mammals elsewhere. Most mammals are placental, like us, carrying their babies inside, feeding them via a placenta. In contrast, the Australian mammals, such as kangaroos are a separate branch on the tree of life – they are marsupials, carrying their young (joeys) in pouches. Despite the fact that they are different branches of the tree of life, very similar life forms have evolved independently in both the marsupial and placental mammals. For example, both branches have things that look like mice, cats, dogs and moles. There are even extinct sabre tooth tigers in both branches. The amazing thing here is that all of the placental mammals are more closely related to the other placental mammals than they are to the marsupial versions that look identical. A mole is more closely related, and so more similar at the DNA level, to a whale than it is to a marsupial mole. This shows the extraordinary power of natural selection to produce similar solutions to similar problems. That is convergent evolution. Convergent evolution. Marsupial and placental mammals are often used to exemplify the concept of convergent evolution. Thylacosmilus was a genus of sabre-toothed predator that is closely related to present-day marsupials (right). It inhabited South America until approximately 2.5 Ma. At about 0.8 Ma another sabre-toothed predator turned up in South America, the better known Smilodon, or "sabre-toothed cat", a placental mammal (left). 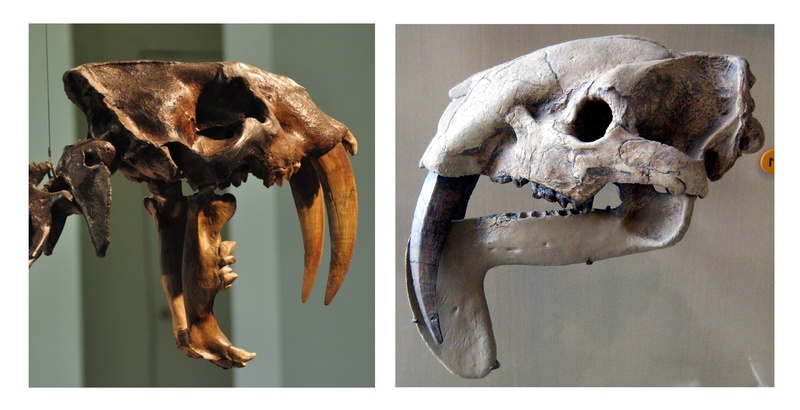 Importantly, these sabre-toothed predators, Thylacosmilus and Smilodon, evolved completely independently from each other in the Americas (Image credits: Claire Houck, Wikimedia Commons [right] and Robin Stevens [left]). At the same time, just because evolution can be convergent, we shouldn’t expect it to always produce exactly the same thing. Kangaroos jump whereas antelopes walk. Some predators, such as wolves, hunt in packs, but others, such as tigers, tend to hunt alone. There are no bat-like or fully aquatic marsupials, to match their placental equivalents. We can expect convergence, but details, history and chance can also matter, to produce different outcomes. So, we can ask, how convergent would evolution on other planets be with evolution on earth? How much would aliens really look like earth creatures? Some things seem to provide relatively universal benefits and so we would expect to see them. Eye-like structures have evolved over 40 times on earth, and so this is something we should expect to find on complex aliens that live in light. Certain types of limbs and body structures provide efficient ways of getting around, and so we maybe shouldn’t be too shocked if we saw similar shaped things on alien planets. Physics can therefore help tell us what alien life might look like. But at the same time, history can play a role in evolution. Natural selection can only work on what is already there, and it can only build incrementally. So, what we see could be influenced by constraints or contingencies that we cannot in anyway predict. Feathers are amazingly good at enabling flight, but they evolved for a different reason, as a form of insulation, and where then co-opted to facilitate flight in a way that has had an incredible influence on the evolution of birds. It isn’t so crazy when Star Wars fills the galaxy with things that reminds us of earth creatures, but it doesn’t have to be that way. Contingency in evolution. Flight feathers are often viewed as prototypical feathers (upper left: here shown the impression of a flight feather of Archaeopteryx). Feathers, however, did not evolve to enable flight. Their initial function appears to have been linked to thermal insulation. Feathers initially evolved in small dinosaurs with one of the earliest feathered dinosaurs being Sinosauropteryx (upper right). As with present-day birds these early feathers came in varying colouration and the blaze of colours of the Sinosauropteryx plumage is limited only by the artist's imagination (bottom left). 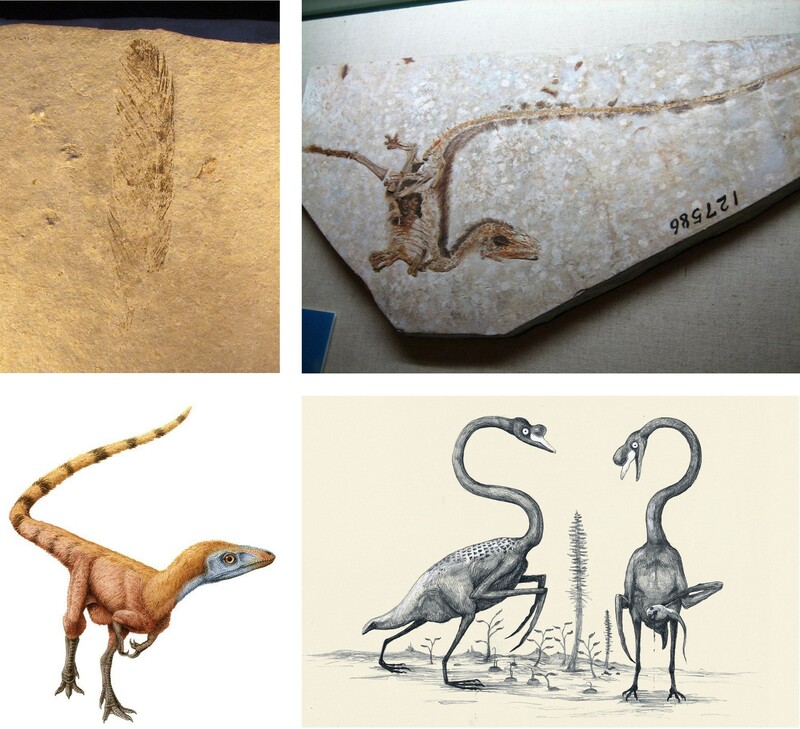 From a taxonomic viewpoint, birds are extant dinosaurs, a notion that is easier to grasp when depicting birds without feathers (bottom right). Without invention of feathers by dinosaurs there would be no birds nowadays, nor would there be any other bird-like creatures because the evolution of feathers happened only once in the history of life on earth (Image credits: H. Raab, Wikimedia Commons [upper left]; Sam Ose/Olai Skjaervoy, flickr [upper right]; Charlie1022, Dinosaur Alive Wiki [bottom left]; C.M. Kosemen [bottom right]). Evolutionary theory is also able to tell us something about how you can evolve big changes. The evolution of life on earth has depended on a small number of major events that we call "major evolutionary transitions". In these transitions, a group of individuals that could previously replicate independently joined together to cooperate and form a more complex organism . Examples of such major transitions included simple replicators joining to form the genome, or bacteria-like single-celled organisms evolved into multicellular organisms like animals and plants, or solitary living insects evolving into the social colonies of ants. Once different individuals joined together, they evolved to perform different jobs, with division of labour. We tend to think of a human as a single individual animal, but you can also think of it as a highly cooperative group of cells, where different cells perform different jobs, like liver, skin or eye. These major evolutionary transitions are fundamental to the evolution of complex life. Without a major transition we would still just be simple replicators. However, we also know, from both theory and data, that these major transitions require extremely special conditions. For example, the evolution of multicellular animals was possible because reproduction involves a single cell stage, and so all the cells of our body are genetically identical (aside from the odd mutation). This eliminates any potential for conflict and so makes all the cells have a shared interest to pull together and cooperate. The phenomenal level of division of labour that we observe in the human body would not be possible if there was appreciable conflict between cells. Major transitions in space: "The Octomite". A complex alien that comprises a hierarchy of entities, where each lower-level collection of entities has aligned evolutionary interests such that conflict is effectively eliminated. These entities engage in a division of labour, with various parts specializing on various tasks, such that the parts are mutually dependent (Image credit: Helen Cooper). Consequently, if we saw a complex alien, we would know that it had gone through major transitions. We know that this requires special conditions and so we can predict what complex aliens would be like. They would be made up of a hierarchy of different entities, just as we are made up of different cells, and those cells are built by different genes. Furthermore, there would be some mechanism to align the interest of all those entities. Maybe they would be identical, or maybe their replication would be completely linked. Will they have space ships? Of course what would perhaps most interest people is if we found a highly advanced species, maybe even with the ability to travel in space and visit us. Can evolutionary biology tell us anything about whether that will happen? Possibly the major difference between humans and the rest of life on earth is our ability to pass on information directly between individuals, using language to teach and learn. The process by which we can pass information in this way is sometimes called "cultural evolution" – what is special is that we can pass information directly, using language, without it having to go into our DNA. This is amazingly efficient, and has allowed us to construct complex tools, build civilisations and travel to the moon. The great leap in human evolution has come from cultural change via language not via genetic change. Genetic change was required for language to evolve, but once we had it, it allowed a new form of evolution. In order to become advanced enough to construct space ships aliens would need something analogous to language and cultural evolution, to develop the required technology. But how likely is that? A sophisticated language, with an ability to teach and learn, and the manufacturing of complex tools, has only developed once on earth, in the human lineage. Language didn’t evolve to help us build space ships, just like feathers didn’t evolve for flight, but it has allowed us to get there. The fact that sophisticated language has only evolved once on earth suggests that chance could be important, just like it was for the role of feathers in flight. The closest examples outside of the primates, in terms of cultural evolution, are things like meerkats teaching young how to handle poisonous scorpions, or ants showing other ants where to find food, but this is nothing like what happens in humans. Some animals such as crows or chimpanzees use simple tools, but it hasn’t really progressed beyond using a stick to eat ants. And crow space ships do not seem imminent. Tool manufacturing. Tool usage is rare among animals but the manufacturing of tools is even rarer. (left) New Caledonian crows not only use simple sticks to fish for grubs in tree trunks, but they also manipulate the sticks to increase their efficiency . Such tool manipulation ability is unprecedented in the animal kingdom except for the primates. In this mammal group tool usage is found in several different species and one lineage, the hominins, became particularly apt at it. The world's oldest known manipulated stone tools are 3.3 million years old . These artefacts predate the earliest humans in the Homo genus. So who made them? A possible candidate is Australopithecus afarensis, more famously known from the fossil Lucy (right). Watching a group of ape-like creatures 3.3 million years ago in the African savannah playing around with rocks and stones would hardly lead to the prediction that this activity would once result in building space ships, but this was exactly the evolutionary trajectory (Image credits: Gavin Hunt/University of Auckland [left] and Roman Uchytel, prehistoric-fauna.com [right]). Consequently, convergent evolution of high intelligence and language hasn’t occurred on earth. It has just happened on the way to modern humans. This means that just like the initial evolution of life, which appears to have only happened once on earth, it is hard to predict how likely this will be on other planets. If life evolves on another planet, then we expect natural selection to lead to interesting and non-trivial organisms, but it isn’t clear how likely it is for culture to evolve. Maybe alien planets will generally only have what we would class as complex but unsophisticated things. But maybe there will be convergent evolution across planets for the level of intelligence that can lead to space travel. The only way to find out is to discover life on other planets and see what it is like. 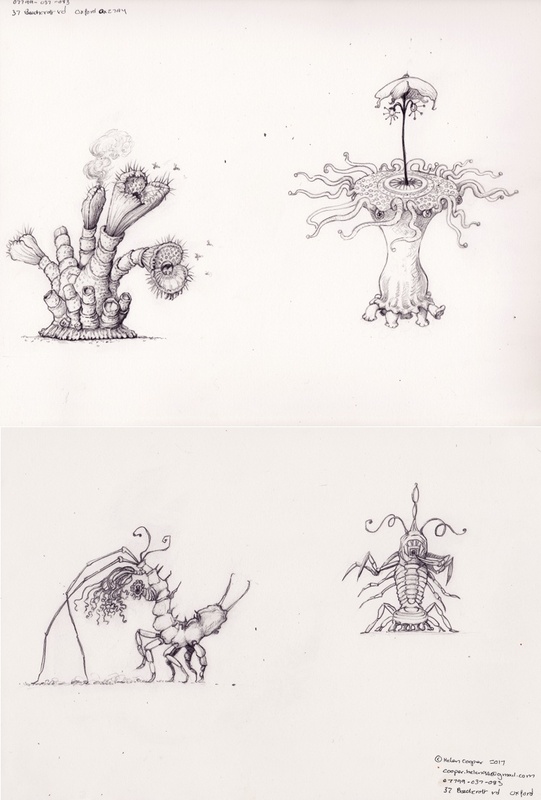 The drawings of aliens where done by Helen Cooper, a prize winning children’s author, known for books such as Pumpkin Soup and The Hippo at the End of the Hall, but who is also an amateur evolutionary biologist. Communicating science in an appealing manner matters to our scientists, and if you would like to show your appreciation of their commitment, please feel free to beef up our Author of the Month award. This work is distributed under a Creative Commons Attribution ShareAlike 4.0 International License (CC BY-SA 4.0). Its use, distribution and reproduction in other forums is permitted provided both the original author(s) and Capeia are accredited, and the license is unchanged (CC BY-SA 4.0). Images or other third party material in this article are covered under the article’s Creative Commons license unless otherwise indicated; if the material is not covered under a Creative Commons license, users will need to obtain permission from the license holder before it can be reproduced. Stuart West is an evolutionary biologist at the University of Oxford. 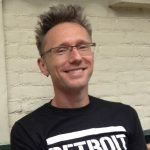 His main interests are mechanisms of adaptation and the evolution of social behaviours. By sharing this article you increase its score. Each month, the author with the highest score gets a bonus!